Description: NS local crossing Rivers Ave. Description: 213 rolls up the hill at Five Row with a catfish on the lead. Description: Eastbound Roadrailer on track one with a GEVO leading. Description: The main power for NS 500 is D9-40CW 9665 and ES40DC 7514. Description: Rolling east on the BNSF was NS Train 263 RoadRailer at sunset headed for Argentine and then home rails as the C415 watches. 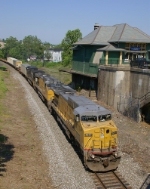 Description: An NS raodrailer train rushes east out of the sunset toward Kansas City. 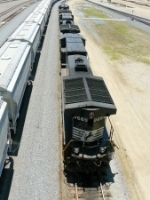 Description: NS train 19G is making a pickup at the small yard near the main Hershey Chocolate plant in Hershey, Pennsylvania. Description: 185 is up in the sky as he passes over me near Ingleside.